Four-color process printed on both sides of 12pt C1S White Semi-Gloss stock coated with Aqueous Satin. H3 business card slits on left pocket, and H2 business card slits on right pocket. This design highlights a map of the town of Parker, Colorado. 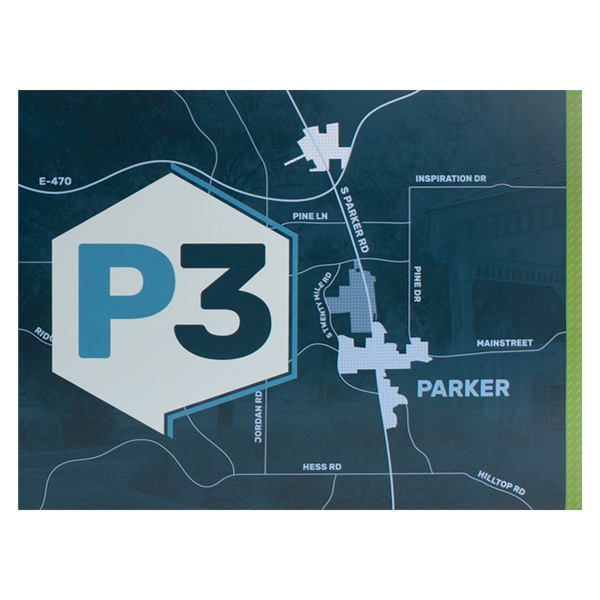 The logo of P3, a public/private partnership to develop the city, dominates the cover inside a large hexagon. Images of the town are in the background of the blue cover, which evokes feelings of security. A green edge matches the color of the pockets inside, suggesting growth and renewal. Side 1 printed with 2 PMS colors using heavy coverage, and Side 2 printed with 1 PMS color using heavy coverage on 130lb C2S White Dull stock. Side 1 coated with Aqueous Matte and Bio-Plus Spot UV. Side 2 coated with Aqueous Gloss. V3 business card slits on right pocket. 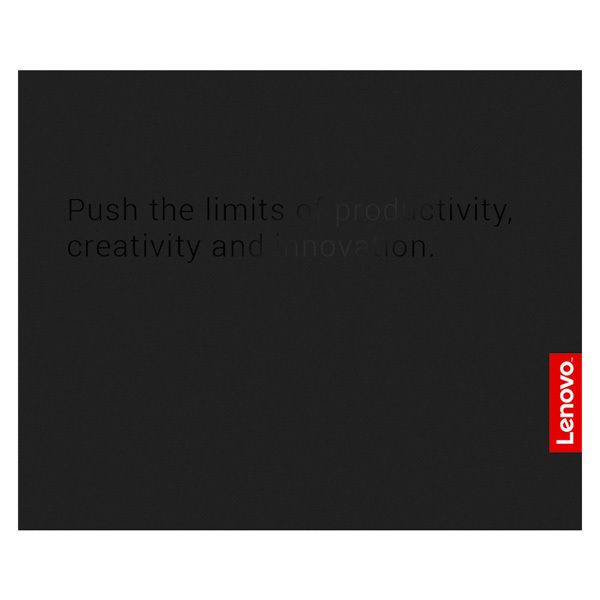 Lenovo's slogan shines and stands out on the cover in a Bio-Plus Spot UV coating. The only other color in the design is the red rectangle housing the company name on the edge of the cover, creating a sense of urgency for recipients to open the folder. Turn your clients' expectations upside-down with this stylish product. Its landscape orientation creates a wide design canvas that's perfect for printing large, detailed photos on both exterior covers. Two interior pockets give you ample room to include a panoramic photo or custom branded information. Both pockets are v-split, allowing extra flexibility when filled with 8 1/2" x 11" papers turned sideways or custom printed in landscape orientation. Dimension Open: 24" x 9"